Larkspur is the most commonly used name for the delphinium plant. There are over 300 species in this flowering perennial plant family. It is native in most of the northern hemisphere and grows in the wild. There are many hybrids that are cultivated in order to produce color. Bloom sizes and colors vary, with blue being the most common color. Some varieties are considered to be an endangered species in areas. Delphinium bakeri, also known as Baker's, is an endangered species. This perennial herb is found in California and is heavily protected. It has been listed as a federally protected species in the wild. Flowers are a deep blue or purple and have a unique petal shape. Flowers are present in April and May for many of these wild plants. It is often found growing on decomposed shale among coastal scrub. It was nearly extinct due to road crews that removed it as a weed. It was cut down with lawn mowers, promoting claims of its demise. Further work reduced the population in the wild to even fewer plants. D. luteum is also known as Yellow Larkspur, and is also endangered. This small herb also grows in California and produces yellow blooms. They are often pollinated by hummingbirds and are protected species. Delphinium variegatum is another California native flowering herb. Blooms are often purple or a deep blue, with some appearing white. Bloom color is often determined by the particular species of flower. For beginners, only new plants should be purchased for gardens. This means selecting plants that are one year old or less for starts. Younger plants are often easier to establish in a home garden or lawn. If seeds are used, select only well known brands that perform well. Poor seed quality can lead to lost time and weaker plants in gardens. Many garden centers will recommend purchasing an established plant. When planting it is important to ensure as much sun as possible. Shade or lower light leads to reduced flowers and slower growth. At least four to six hours of full sun per day is necessary for most. These plants are also heavy feeders when it comes to fertilizer. Unlike most plants, these will thrive with extra regular fertilizer. Liquid fish emulsion or compost can be added regularly to feed. Care should be taken to avoid over feeding with nitrogen plant food. This particular fertilizer can harm the plant if too much is used. Leaves may wilt or die off and blooms may suffer when it is overfed. For most species, the more food it receives the better blooms it has. This can be important when first adding delphiniums to any garden. It can also help starter pods take root and become established. Staking is often necessary for many of the taller hybrids available. A stake can keep stems and blooms upright without leaning or falling. A plastic or wooden stake may be used, along with twine for stems. A feeling of being light of heart is often associated with blooms. The airy blooms make it a simple way to express joy and happiness. 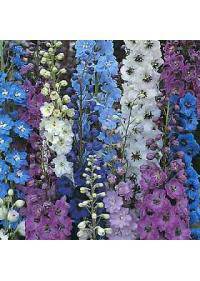 Larkspur is also used to show attachment to friends and loved ones. Delphiniums are typically on sale at Duluth, MN, Manchester, NH, High Point, NC, Boston, MA, and Palm Bay, FL. You can usually order them for mixed arrangements that need a touch of cool colors to balance itself out.